Something that webOS homebrew users have known, loved, and used since soon after the Pre's launch in 2009, is the ability to theme the OS to your heart's content. This capability continued well after the Pre launched, even having themes created for the TouchPad right after it launched last July. 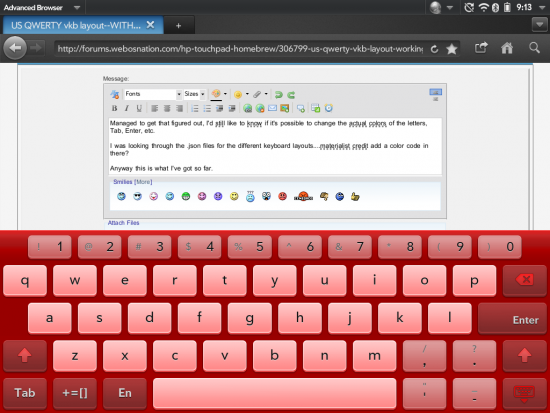 One thing that webOS users have never been able to do, however, is theme the keyboard. Prior to the TouchPad, no webOS device had a virtual keyboard so that was more of a hardware limitation than software. Turns out applying a software theme to physical buttons is more difficult that the scientists expected. The TouchPad, though, has a great virtual keyboard, but the default color scheme can get a bit...shall we say, boring. webOS Nation community member sledge007 had enough and has released five different keyboard themes on the forums that can be installed onto your TouchPad simply by using the homebrew app Theme Manager. The five themes that sledge007 released are: TheRedKeys (shown above), ThePark, Old Glory, Pink, and Blues; webOS Nation forum user geekpeter contributed a couple themes of their own, two of which provide the nostalgiac feel of an old-school hardware keyboard to webOS. In addition to the five themes, sledge007 posted some information to help others make their own themes for the virtual keyboard and seems to be taking requests for other theme ideas. Improvements such as this don't always come without limitations. One such major limitation that some might dislike is that the keyboard cannot be transparent and appears to have the background image placed on top of a black background. Another major limitation is that the color of the key text cannot be changed and must always remain black, although some in the community are investigating to see if they may not be able to change this though such attempts thus far have proved to be fruitless. We look forward to seeing what comes out of this and we applaud all of the effort dedicated to this so far.